Vacation rental cottage. Sleeps 10, 4 bedrooms, 1.5 bathrooms. No pets allowed. Endless fun and relaxation on Lime Lake! Beautiful and well kept cabin located in a wooded area on the shores of Lime Lake in Leelenau County. 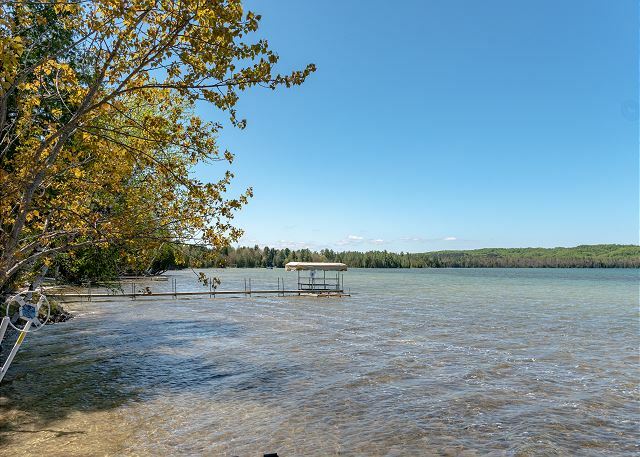 Lime Lake is a beautiful body of water with almost Caribbean blue water and sandy shores. Aerial shot of Lime Lake looking out towards Lake Michigan and the Manitou Islands. 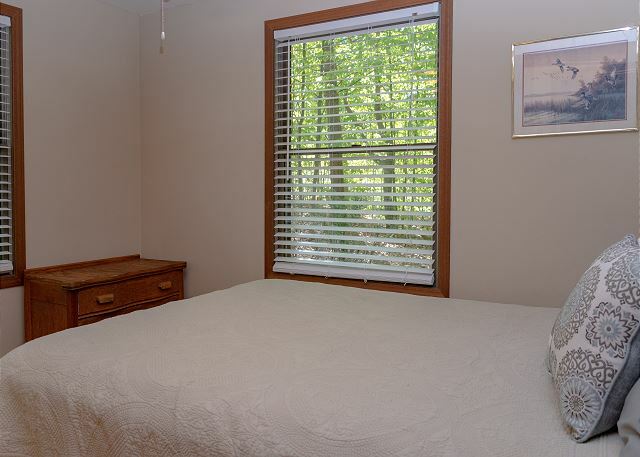 The cottage is located in a serene and quiet location, yet it is close to many major attractions. 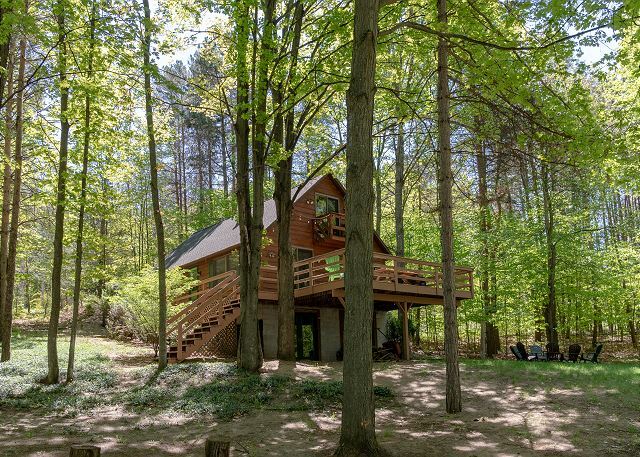 Peaceful wooded setting surrounded by lush greenery. Large upstairs bedroom with king bed and a balcony. Spacious upper bedroom with king bed and balcony. The view looking from the master bedroom balcony down to the large private deck. Large upper bedroom with double bed and queen. Upstairs half bathroom convenient to both upper bedrooms. View from master bedroom looking back towards bathroom, stairs, and second upstairs bedroom. Stairs from main level to upstairs. Living room and dining area looking out towards the large private deck and back yard. Living room area and stairs to upper level. Main floor full bathroom with stand up shower and tub. Dining room and living room as seen from the kitchen. 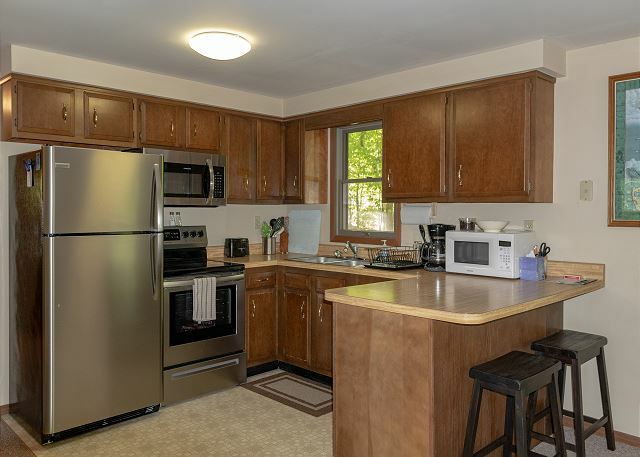 Fully stocked kitchen with all major appliances. Large private deck with picnic table and gas grill. 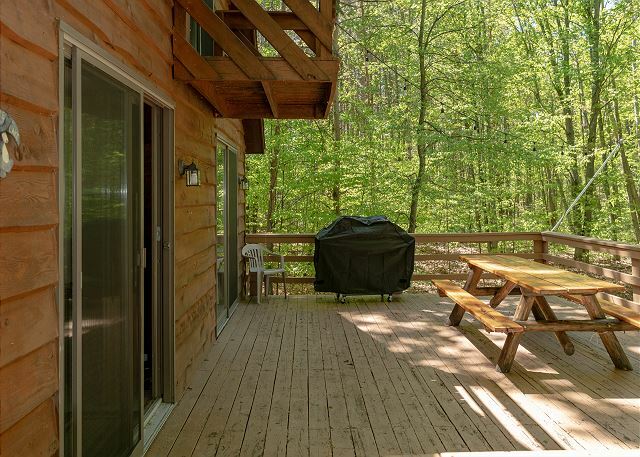 Large private deck with chairs, picnic table, gas grill and beautiful views towards Lime Lake. 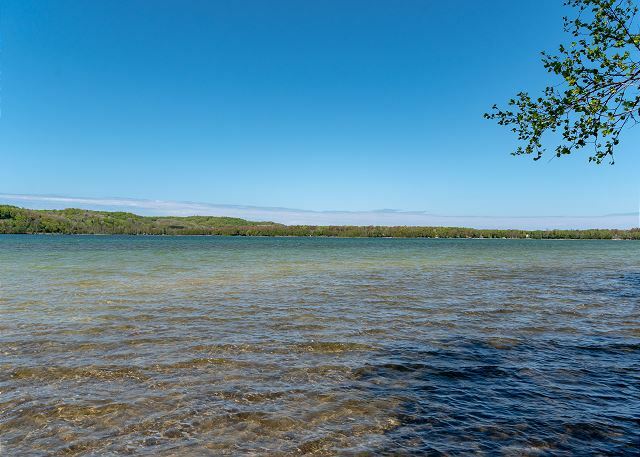 Lime Lake is a beautiful and crystal clear lake with incredible blue and green waters. View of the side deck looking out towards Lime Lake. Large lawn with adirondack chairs and plenty of room for games and activities. Amazing sunsets looking west over Lime Lake. New shared dock. Bring your boat and tie it up at night, no need to trailer it every night! The ultimate lake house destination to make family memories that will last a lifetime. View of the dock and the frontage area looking from the water. 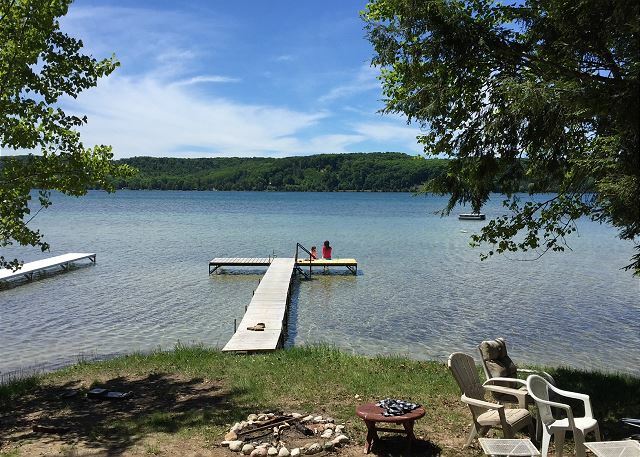 Are you looking to take your family on the quintessential Northern Michigan summer vacation? Well, look no further! 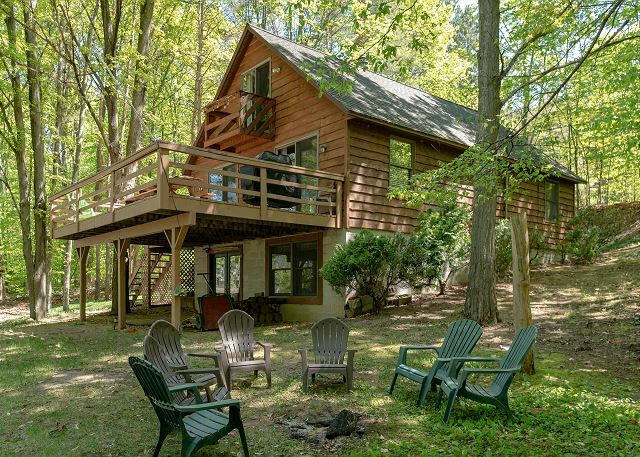 The Lime Lake Cottage feels very "Up North" and is located just off of the world famous M22 Scenic Highway, just minutes from Glen Arbor, Sleeping Bear Dunes, dozens of wineries, Leland (Fish Town), Traverse City, and SO MUCH MORE! Lime Lake is 675 acres big, all sports, 100’ deep in spots. Great for small mouth, pike and trout fishing. The cottage is 3 levels, with a walk out basement, a full main level, and an upper floor with two bedrooms and a bathroom. 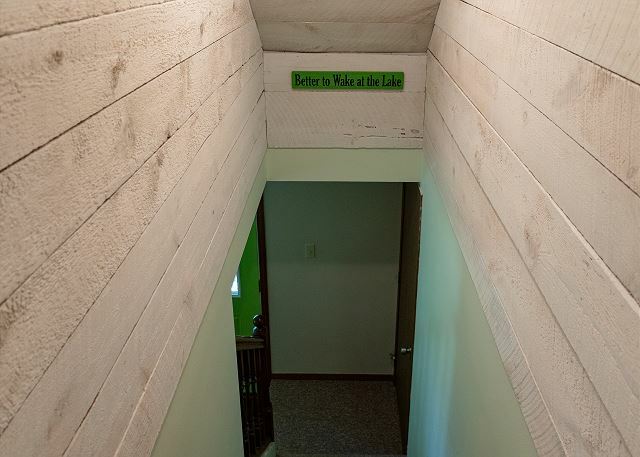 The basement is a storage area with a pool table and plenty of room to store your bikes or other toys during your stay. The main level includes a kitchen with all major appliances, a dining area with room for at least 6 people, a living room with a flatscreen TV with cable and wireless internet. Two bedrooms and a full bathroom complete the main floor. The upper floor has two bedrooms, and a half bath. 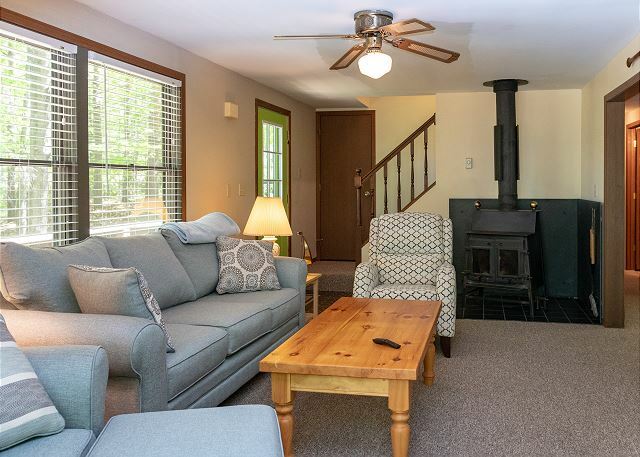 The cottage has shared frontage and a dock on beautiful Lime Lake just a short walk away, as well as a fire pit, and chairs for hanging out by the water. 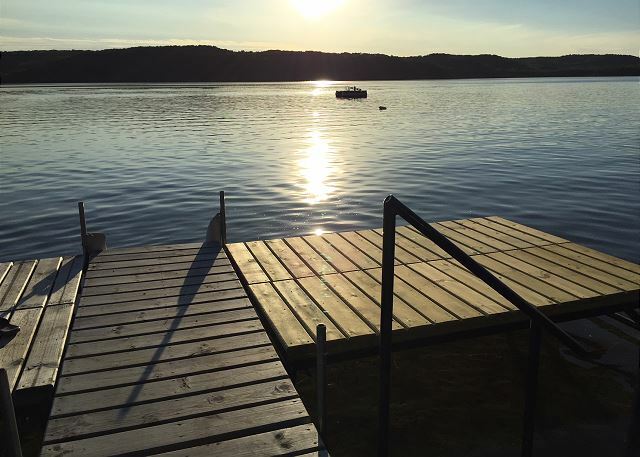 Have a s'more, take a dip in the lake, there isn't a better place to enjoy summertime in Northern Michigan. The cottage does not sit directly on the lake, but is only a 3 minute walk away and the frontage is indeed beautiful. There are 6 wine glasses inside the property from Good Harbor Winery. If you take these glasses to their tasting room, they will give you free tastings! Just please return the glasses before you depart. There is a canoe and paddles provided, as well as some life jackets for you to use! Dawn S does not recommend this vacation rental. The cottage is in a great location and there are many towns and attractions nearby. Beautiful, well maintained and roomy. I am hoping to stay again next summer! Thanks Jackie! It's hard to beat Lime Lake in the summer time, glad you had a good experience and we hope to have you back again soon! The cabin on Lime Lake is just as the pictures show. It was clean on our arrival and had everything we needed. The living room space is very comfortable and we really enjoyed eating outside on the deck. The upstairs half bath is attached to one bedroom, not in the hall. You can glimpse the lake sparkling through the trees and the lake is a short walk away. We brought our own kayaks and my brother used the canoe to fish (he caught several small-mouth bass). My sons enjoyed swimming and wading in the lake and finding crawfish and frogs. The shared access and dock are very nice and the neighbors we met were very friendly. There's not a sandy beach, though. The lake is clear with a soft, sandy bottom and stays shallow for quite awhile. Not a lot of boat traffic on the lake. 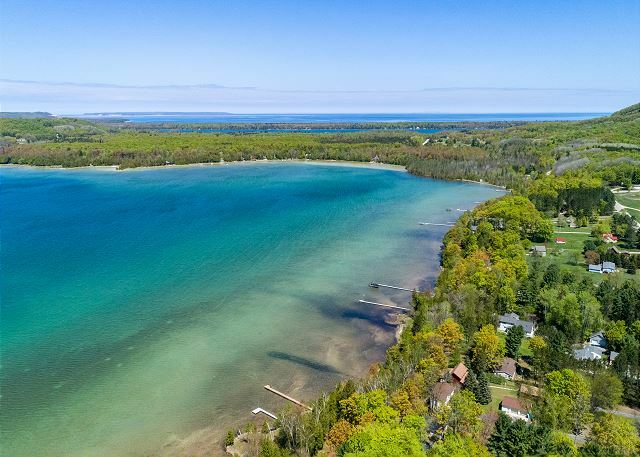 There's quite a bit to do in the area: Sleeping Bear Dunes, Empire Bluffs trail, Glen Arbor, Good Harbor Bay Beach and Leland, among others. 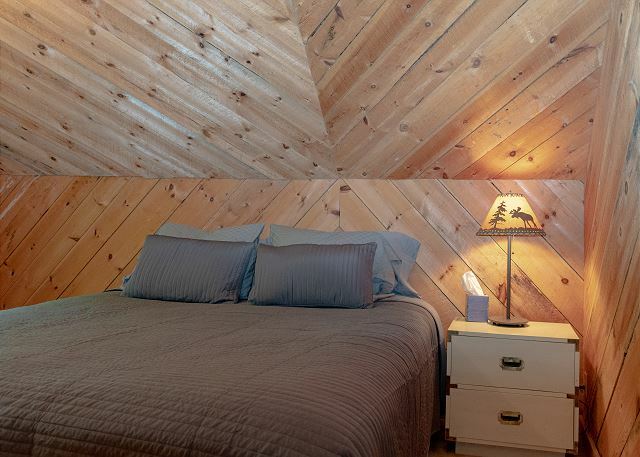 The cabin is quiet and cozy; a great north woods retreat. Our stay included young kids, teenagers, adults and grandparents and everyone loved it. We had excellent customer service from Unsalted Vacations from the booking with Keagan to quick and timely responses from Aaron and Philip with questions about the rental. 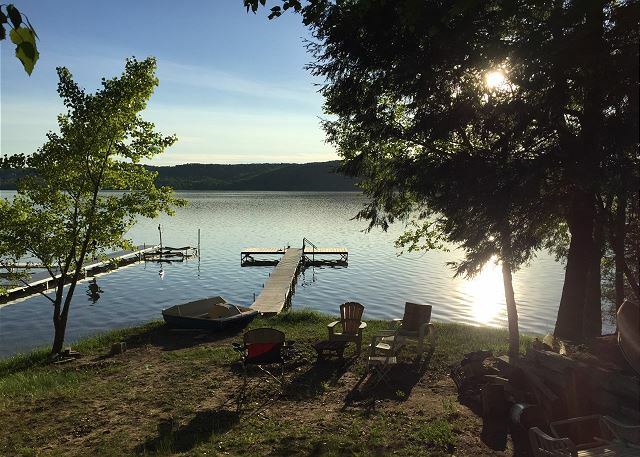 Hi Anna - We were thrilled to hear how much you enjoyed your experience at the Lime Lake Cottage! It really is a special place. We hope to host you again soon, thank you for choosing Unsalted Vacations. When we arrived unfortunately the place had not been cleaned, however, Laura at Unsalted Vacations could not have handled it any better!!! She was very apologetic and credited back our cleaning fee and one night stay without me even asking. The house itself was very nice the only down side was I thought it would be closer to the water! Overall we have a great time and enjoyed the home. Again the gals at Unsalted Vacations did an amazing job from day 1 and throughout our stay!!! Hi Marian - thank you so much for the kind words. We really appreciated your grace and understanding and we are grateful that you enjoyed the getaway despite the issues encountered at check-in. We hope you keep us in mind in the future as we would love to host you again. Thanks so much for the review Lori, we appreciate you taking the time to give feedback and we are happy you enjoyed your visit. Please come back and stay with us again soon. Great spot, we stayed with another family. A little challenging with a toddler on-the-go, but overall we loved it! Hi Jennifer - thank you for leaving this review, we are glad you and your family got to enjoy your vacation on Lime Lake! We hope to host you again soon. Hi Zelda - So happy to hear that you enjoyed the cottage! That is great feedback about the Traverse City guides and we will make sure to get some inside the property for future guests. Thank you for taking the time to leave this review, we hope to have you back again soon.